S.D. 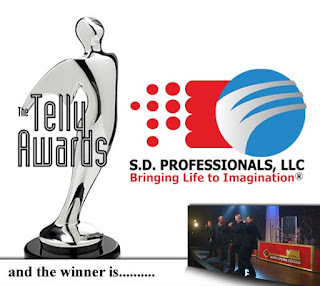 Professionals, LLC voted "People's Choice" for the 2010 Telly Awards! Congratulations are in order for Jacob Timmons and the crew of S.D. Professionals, LLC in Sevierville, Tennessee who were recently named "People's Choice" for the 2010 Telly Awards! This prestigious award was voted on by both the elite panel of Telly judges and by You-Tube viewers across the world. "We are extremely excited since this was our first RED ONE 4K production at Dollywood and our first time being up for a Telly Award. Then to take home the award, well that for us is simply incredible. We definitely want to send a special thanks to the Telly judges and to the wonderful people who took the time to vote for us!" said Jacob Timmons, President of S.D. Professionals, LLC. Timmons, along with his hand selected industry professionals, recorded the live performance of Dollywood's original gospel quartet, the Kingdom Heirs, in the Showstreet Palace Theatre. Celebrating their 25th Anniversary this year at Dollywood's Adventure Park in Pigeon Forge, TN, the Kingdom Heirs deliver world-class entertainment in “Live At Dollywood.” The entire show was captured using S.D. Professional's new RED ONE 4K cameras and then edited to both SD and HD video. In the past, to shoot a live production would require multiple video cameras as well as still camera photographers to capture moments for print collateral needs such as album covers, posters, and more. Shooting with the new RED ONE 4K cameras, S.D. Professionals was able to record amazing 4K quality video while simultaneously capturing every second of the performance in high resolution still images (up to 60 high resolution stills per second) which were then used to design all print collateral. S.D. Professionals, LLC would like to send a very special thanks to the Kingdom Heirs, Dollywood, R.H. Lighting, The Room Studios, Shanna Norris, Matthew Rogers and everyone who helped make this such a fantastic project to be part of. S.D. Professionals, LLC is a multimedia limited liability corporation located in beautiful Sevierville, TN. For more information, visit http://www.sdprofessionalsllc.com/.